It's not blueberry season, but sometimes cold mornings beg for berries--and what better vehicle for those less-than-perfect winter jewels than a stack of buttermilk pancakes? 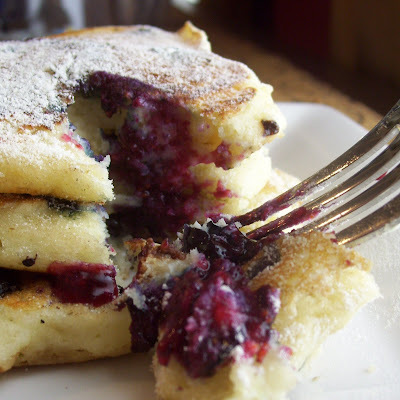 The heat of the griddle pulls the hibernating natural sugars out and the tangy contrast of buttermilk is just enough to get them dressed and out the door (right into your belly!). The ironic thing about pancakes (of all kinds) is that while they're most often associated with lazy weekend mornings and relaxed breakfast-table lingering, making them can often be anything but. Just like with (oven)cake-making, all the factors really do need to be just-so when you're fixing up a batch. The griddle needs to be hot, but not too hot. It should also be greased, but not too greased. The batter must not be overmixed. And let's not even get started on the flipping. Also, depending on how large the crowd you're feeding is, someone is sure to end up with a few cold pancakes. Even non-beginners have trouble. I was actually flipping pancakes the first time I snapped at my boyfriend. It certainly wasn’t his fault. The fault was that of the skillet, which was too thin and too hot and which was (at that very moment) relentlessly charring three of my delicate pancakes into something rather ugly. I wasn’t angry at my boyfriend. I was angry at the skillet and at myself for not being able to produce perfectly something so simple, so *elementary*, as a pancake. That's what making pancakes can do. It can make you hot and crazed and very frustrated. They can make you snap at people that you love and leave you wishing you'd just made scrambled eggs and bacon. But it gets easier each time. Like pianos and the paso doble, pancakes require practice. If I haven't completely talked you out of making these blueberry pancakes (not my plan, I swear!) perhaps some of the following pancake making tips will help. And I'd love to hear any tips that you might have of your own--mine might be good, but they're certainly far from perfect! About that buttermilk. Use it, even if it means you have to wait a little longer while you send someone out to the store to pick up a carton. You can absolutely recreate this recipe quite nicely with homemade soured milk (1 tablespoon of lemon juice or mild vinegar per cup of regular milk, let sit at room temperature for 10 minutes), the texture will be all wrong. Buttermilk, as those who use it know and those who don't should, is thick. It pours slowly, like melted ice cream. It's more viscous than heavy cream and that denseness is just as important as the acidity. If you do make this using homemade sour milk, I would recommend cutting the liquid down by about 1/2 cup or the batter will be too thin and will spread out on your pan making for a much thinner pancake. Adding the blueberries (or bananas, sliced strawberries, chocolate chips, etc.). Don't mix these into the batter. Wait until it's on the griddle and starts bubbling, then drop a small handful one by one into the half-cooked pancake, pressing slightly into the batter with the tip of your finger. They'll set nicely and won't stick to the pan, making for a nice smooth flip. What pan? How hot? If you have an electric griddle, you're golden. Preheat it to 375 then lower to about 360 when you get the pancakes going. If you don't have an electric griddle, your next best bet is cast iron. I have a 10" round cast iron griddle made by Lodge that cost about 10 dollars on Amazon. This works beautifully, although in hindsight I wish I'd bought a square or rectangular one as the circle limits the amount of pancakes I can make (and successfully flip) at once to about 2, 3 if I'm very careful. Nonstick skillets work too, but you want one with a heavy bottom as flimsier skillets have a tendency to overheat. Heat your pan over medium heat while you prepare your batter; test it by dropping a splatter of water on it and watching to see if it beads up and dances on the surface of the pan before evaporating. If so, you're ready. If the water just sits on the pan, it's too cold. If it sizzles and evaporates immediately without beading, it's too hot. Mixing. Combine the ingredients with a light hand, just until the all the dry spots disappear. Try and think of it as a mix between folding (like you would with mousse or angel food cake) and regular mixing (like with cookies). There will be lumps in the final batter. This is good. You want lumps. Don't mix away the lumps or you'll end up with flat, tough pancakes. Feeding a crowd? Keep cooked pancakes warm while you finish the batch by spreading them in a single layer on a paper towel or parchment-lined cookie sheet in a 200 degree oven. Make sure to keep the pancakes in a single layer so they don't stick or become soggy, and don't raise the oven heat higher than that as it will essentially bake the pancakes, making them dry and rubbery (I say this from experience). For a smaller batch, a plate placed over a large saucepan of gently simmering water will also work (think hotel breakfast buffet chafing dish style). More butter? Tossing a whole pat of butter on the griddle might be easy, but it will make your pan burn and smoke in between pancakes or leave them all looking and tasting just a teensy bit fried. To better control the amount of fat you use (for cooking, not dieting purposes), use a brush dipped in melted butter or vegetable oil to brush lightly over the entire griddle. Alternately, peel off an inch of paper from a new (cold) stick of butter and hold by the wrapped end while you glide it directly and quickly over the pan much in the same way you would lip balm on your lips. In between pancakes, keep this away from the stove to keep the whole stick from melting. I actually use this technique for buttering all my pans (even those I'm baking with) and reserve one stick just for this use. Flip fantastic. Start with a metal spatula; plastic is too thick and the edges will melt when they come in contact with the heat. Wait for the right moment. The batter should have little pockets of air bubbles rising to the surface and the edges should appear slightly cooked. Slide the spatula under the pancake and gently rotate it around the sides to loosen the edges. Then lift and flip it in one smooth motion. Use the spatula to immediately tuck in any bits of batter or filling that escape from the sides (this is how you get those nice smooth edges). Don't press down on the pancake with your spatula, just let it cook. If the pancake tears in the first flip leaving raw batter on the top, give it a second flip and let cook for 20-30 seconds to seal that up. Not quite ready.You serve the pancakes, cut into them, and find that the filling is a bit more...er...raw than it should be. No worries. Pop the plate into the microwave for 15-30 seconds; that should be enough to finish cooking the inside. Another drizzle of syrup and you're in business! Made too many pancakes? Place cold pancakes in individual freezer proof baggies and toss into the freezer. On your way to work or school in the morning, grab one and throw in the toaster or microwave for a tasty portable breakfast or snack. Pancakes came out flat and tough? Don't toss them! Let cool and then spread with cream cheese, jam, or even slices of cheese and ham for an unconventional sandwich! Out of maple syrup? Simmer 1/2 cup water with 1/2 sugar and some flavorings of your choice (berries, lemon or orange peel, vanilla bean, anise) for 5 -10 minutes until reduced. Let cool, strain, then drizzle over your breakfast for a quick homemade syrup. Or try melting (non-recalled) peanut butter, jam, or a dollop of lemon curd. An apple diced and tossed with sugar, butter, and a dash of cinnamon makes a yummy and easy caramel sauce. Hints of orange and almond combine with the blueberries and tangy buttermilk for a really wonderful treat. Lemon and vanilla can also be substituted for another tasty variation. This recipe makes about 8-10 pancakes (enough for two) but can be easily doubled if you're serving more. Preheat your griddle to 375 or heat cast iron griddle or skillet over medium heat. Preheat your oven to 200 degrees. Prepare a large cookie sheet by lining with paper towels or parchment paper and set on the top rack of your oven. Sift together dry ingredients: flour, baking powder, baking soda, sugar, and salt. In a separate bowl, whisk together the egg, buttermilk, melted butter, extract, and citrus zest. Add the wet ingredients into the dry, and combine gently until all the dry spots are gone, but some lumps remain. Be careful not to overmix. Brush your griddle with butter and pour the batter a 1/4 cup at a time, making sure to keep the pancakes about 2.5 inches apart. When the batter starts to bubble, drop a few of the fresh blueberries onto the pancake, pressing them in slightly with your finger. Let the pancakes continue to cook until the edges appear set and dry, then flip using your spatula to tuck in any extra batter that escapes. Let cook for an additional minute or two before removing to a paper towel or parchment-lined cookie sheet in a preheated 200 degree oven. Repeat with the rest of the batter until all the pancakes are done, making sure to keep the pancakes in a single layer. PS I made your pitas today and they puffed! yay! I make pancakes quite a bit and I'm always fiddling with them. These look pretty amazing... love the addition of orange in there. Awesome guide! I need to make pancakes sometime in order to convince my boyfriend that he's doesn't hate them. I'm also guilty of snapping at my boyfriend while cooking...only I do it pretty much anytime he starts hovering while I'm in the kitchen. We both got pretty nasty while juicing some limes last night, and not in the good way. Wow! What a great post!! I am impressed!!! One of the great pancake making secrets I learned from a cook at Stacks (a small breakfast chain the Bay Area), is to add the baking soda at the end, after every thing is mixed in, and then wait a couple of minutes before cooking. You can see the bubbles rise in the batter, and it makes for super fluffy pancakes. I just blogged about Cottage Cheese Pancakes with Orange Butter Honey, should you be interested. What a lesson ! I want to try to make almost-perfect pancakes ! Yours look abs scrumptious ! Pictures are very beautiful ! that's a super cute posting. Thank you for being so inspired and inspiring, Alejandra! Such a comprehensive post! I definitely agree about not mixing the fillings into the batter. They're best pressed into the pancake once in the pan - yum! I just made these, and they were wonderful!! I resisted the urge to put the blueberries in the batter ahead of time, and it came out fine. I almost forgot to put the blueberries in from time to time. When it comes to chocolate chip pancakes, I think I will continue mixing the batter with the chips. It comes out just fine when I do, and I can put in a lot more without having it stick to the pan as much. Thanks again for a great recipe!! This just might be the definitive pancake troubleshooting guide! They look wonderful! I agree, buttermilk makes pancakes taste SOOOOOO much better!!!! What an awesome pancake tutorial-the pancakes look fluffy and delicious. I agree with your tip about not adding the berries until later on, it makes such a difference! These pancakes look sinfully delicious! You are so creative with food and have the best tips! Just looking at these pictures made my mouth water! Found your blog searching for recipes with coconut flour - how fun! I've just begun using it, & in light of Aeruynh's comment on sourdough, just made my favorite Sourdough Raisin Rolls (tasahara bread book) using 1/2 cup coconut flour, 1/2 c sprouted (& ground) wheat & 1/2 cup coconut rice in addition to the ww flour - yum!!! They turned out great! I'd love to see what you're doing with coconut flour these days - & the oil is delightful!! these look absolutely delicious! thanks for all the detailed instructions! !